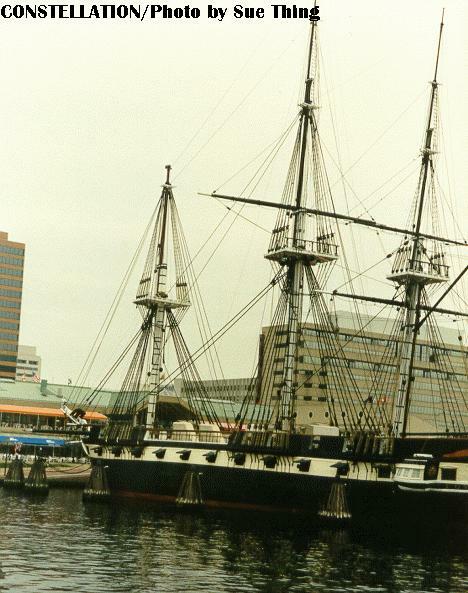 During 1852-53 the old 38-gun frigate USS Constellation, a contemporary of USS Constitution, was broken up at Gosport (Norfolk), VA. At the same time, in the same yard, a new 22-gun sloop-of-war was constructed, and was given the old frigate's name. This new vessel was commissioned in 1855. To get around a Congressional prohibition on new ship construction, the new sloop-of-war was considered a "repair" of the old frigate, but she was actually a new ship. In 1956 the sloop-of-war, by then aged and deteriorated, was donated to a museum group in Baltimore. This group wished to portray the ship as the 1797 frigate, not the 1855 sloop, so they "restored" her by cutting away bulwarks and decks. This weakened her hull structure, and contributed to her eventually deterioration. These photos illustrate the condition to which she had deteriorated by the 1990's, and the first stages of her restoration. 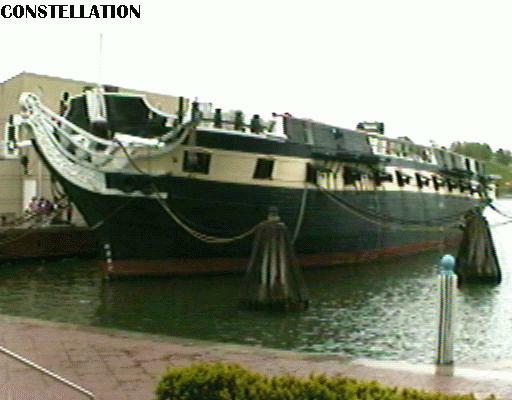 By 1993 Constellation was in very bad shape, and was only a year away from being closed to the public. 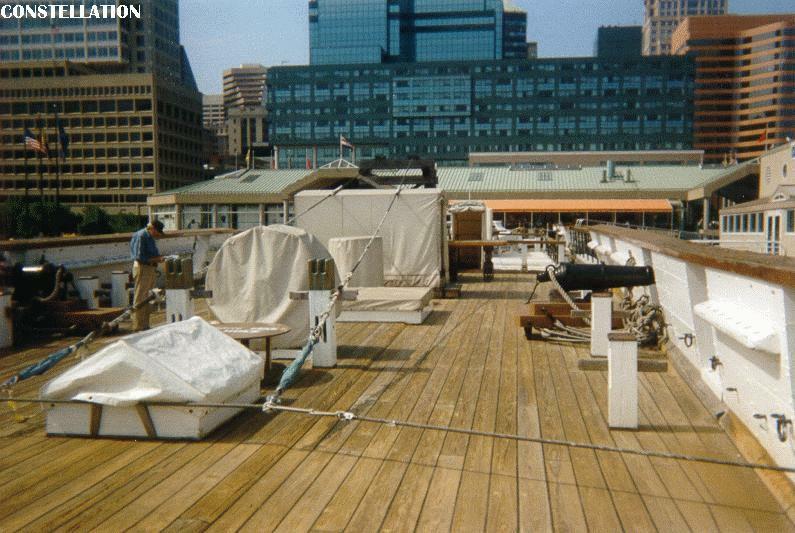 These photos show her in her final pre-restoration days as a museum ship. 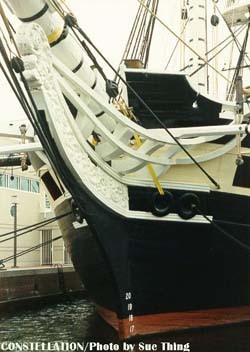 Close-up view of Constellation's bow and bowsprit. Notice the yellow straps running through the hawsepipes and around the bowsprit -- extra support for a sagging hull. (Photo by Sue Thing). In 1994 the Navy conducted a survey of the ship and found disturbing results. Years of minimal maintenance had lead to deterioration on a scale beyond what had been thought previously. Constellation hull was hogged 34 inches, most of her major timbers were badly rotted, all of her rigging was ruined, and she was leaking badly. She was quickly closed to the public and stripped of all rigging and equipment. 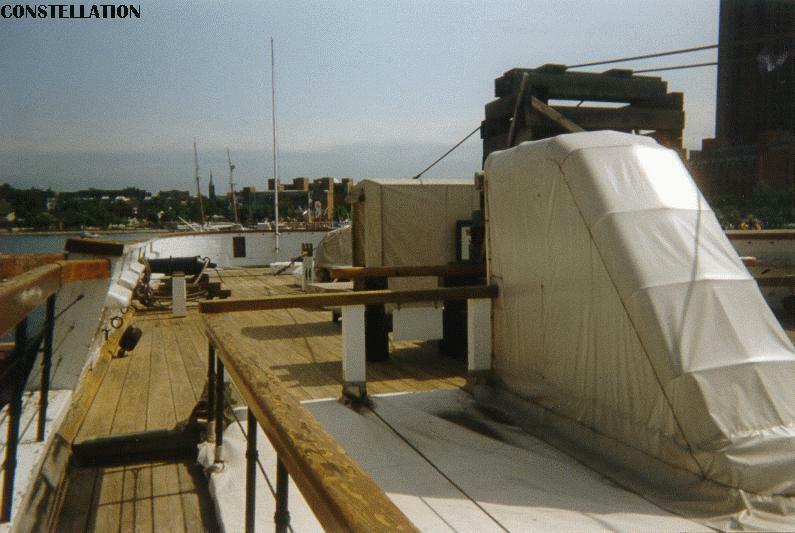 Her aged hull was braced with cables, straps and blocks, and wrapped in plastic to slow the leaks. The original museum group dissolved, and a new organization was founded to rescue the historic vessel. 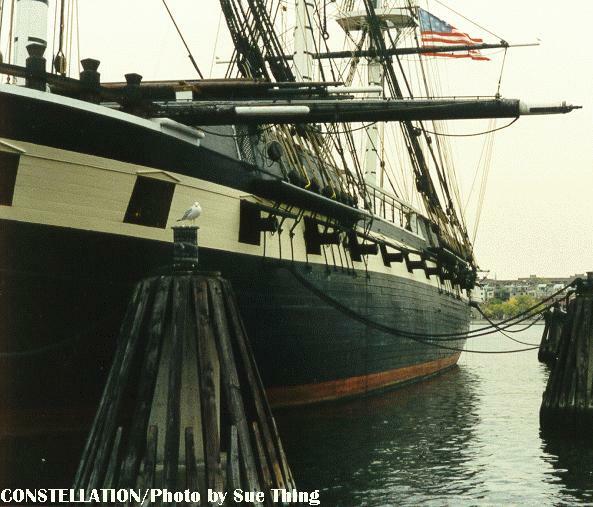 On November 17, 1996 Constellation was moved to a shipyard near Ft. McHenry to start a lengthy restoration process. Her hull was extensively rebuilt, using a combination of modern and traditional construction techniques, to save as much of the original material as possible. She was refloated 21 August 1998, and returned to her normal berth in 2 July 1999. 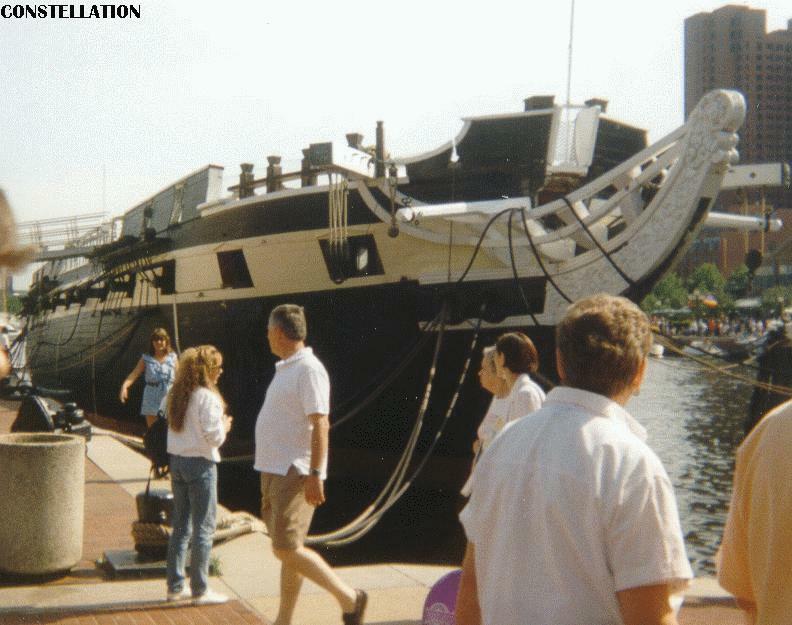 Following the restoration she accurately represents her as-built 1855 appearance, rather than the phony "frigate" appearance of her previous "restorations". A view along Constellation's starboard side in 1995. 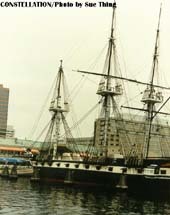 The general deterioration of the ship is evident, as are the gunports cut into her bulwarks to "restore" her as a frigate. As a sloop she had no gunports on the spar deck. Photo by Gregg Germain. A bow-on view of Constellation in 1995. Her hog is painfully obvious. Photo by Gregg Germain. An onboard view of Constellation in 1995, looking forward. The cables serving as trusses to support her weakened hull are plainly visible. Surprisingly, her decks appear to be in relatively good condition. Photo by Gregg Germain. Another 1995 onboard view, looking aft. The stack of timbers at right runs down to the ship's keel, supporting the cables which in turn support her bow and stern. Photo by Gregg Germain. 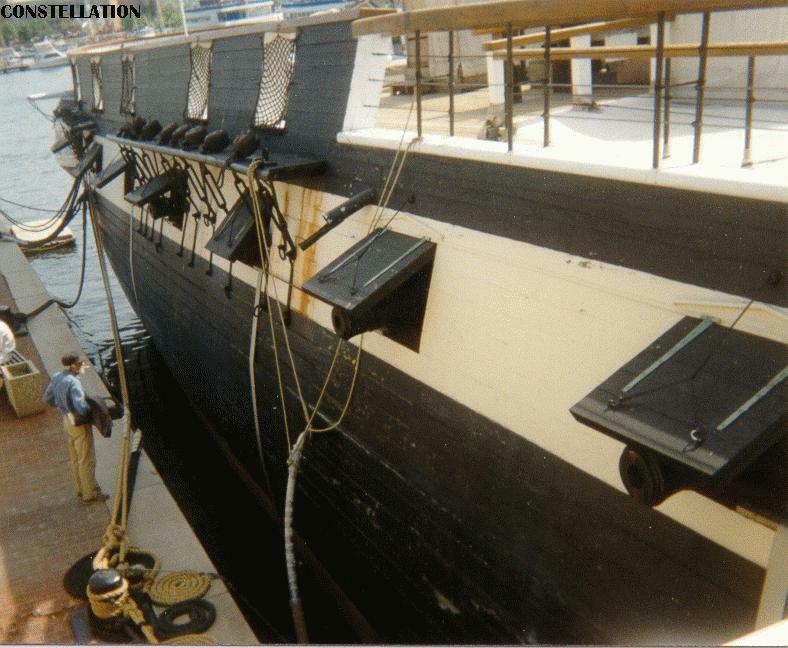 Constellation in drydock during the restoration. The extent of the re-framing and replanking is clear from this view. Constellation shortly before being refloated. For additonal restoration photos, see http://www.constellation.org/.